Why become a member of the Anthroposophical Society? Is the Anthroposophical Society needed in the modern age? 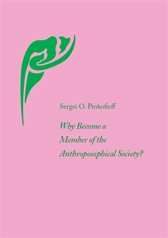 The future of the Society, says Sergei O. Prokofieff, depends directly on competent replies to such questions by each and every anthroposophist. SERGEI O. PROKOFIEFF, born in Moscow in 1954, studied painting and art history at the Moscow School of Art. He encountered anthroposophy in his youth, and soon made the decision to devote his life to it. He has been active as an author and lecturer since 1982, and in 1991 he co-founded the Anthroposophical Society in Russia. In Easter 2001 he became a member of the Executive Council of the General Anthroposophical Society in Dornach. He is the author of many books, more than 25 of which have been published in English translation.